Welcome to the last day of July! Goodness, I didn't think it would ever get here! NOT! I hope this finds you enjoying summer (or fall) because it's whooshing by! I want to let you know that we are safe from the terrifying wildfires raging in Northern California. I hope the same is true for the rest of you living near any of the several wildfires burning out of control around the world. Hammy came back from his adventure raring to go, so we had a lovely crafty weekend with lots to share with you! We broke out the Clarity Stencil Brushes for this QACAS nautical design. I have two left hands when it comes to blending inks with TH doolie-bob blending tools, daubers, and cotton balls. I am better with blending since the Vancouver retreat where I blended with my expert artist friends, but for me the brushes still work better. I used an old unmarked line stencil and an old unmarked rubber stamp for the moon/sun. The sediment is from PTI and the embossing folder is Stately from Craft Concepts. Less Is More: One-layer card with stripes. Seize the Birthday: Toppings: stripes. For this OLC QACAS design, I used a Tim Holtz stencil number 10, masking a circle and a square for the images from Paper Smooches, "My Peeps." 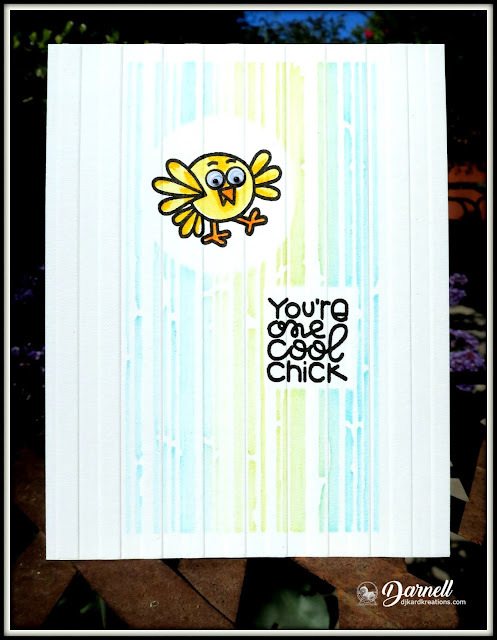 I used an SU Sizzix stripe embossing folder and I colored the cool chick with my Ziggies, giving her some cool chick eyeballs. 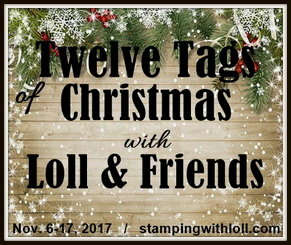 I'm linking to Back to Basics and Beyond (use an embossing folder) and Use Your Stuff (free week / color suggestions). 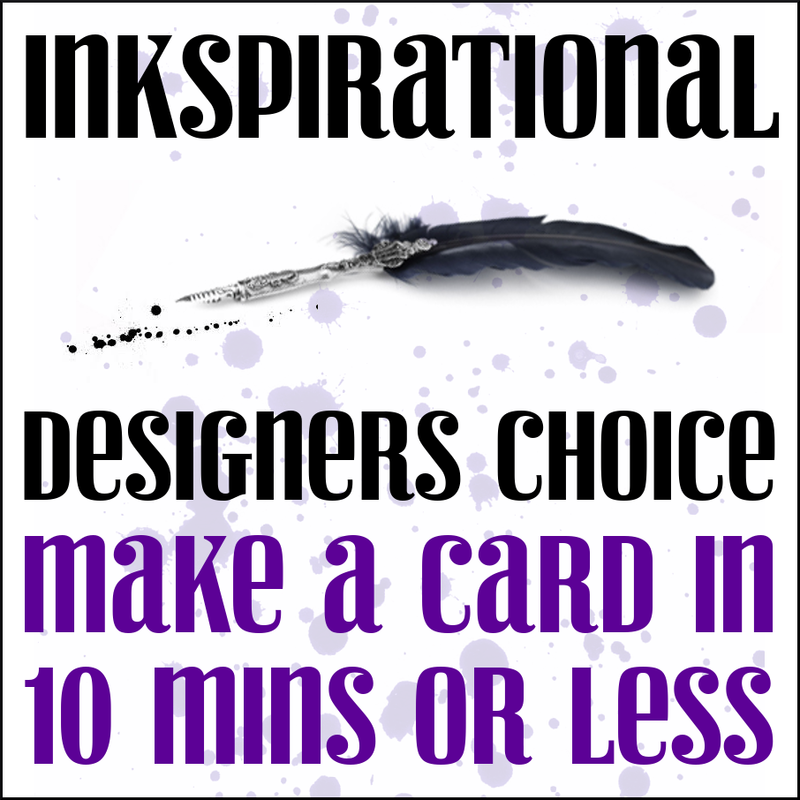 This card was made for the current challenge at Inkspirational where the brief is to make a card in ten minutes or less. Using a linen card base, I stamped the Uniko "Beautiful Blooms II" flower and colored it with my Ziggies. I stamped the simple sediment and ran the card front through the BS using the same striped embossing folder I used in the card above. This card is so simple, it's silly, but I know the lady who will find it in her mail box will be thrilled to know I was thinking of her. It only took me a little over four minutes to bring someone joy! Finally, another Christmas card. I'm so far behind I can see my own wide load in front of me! 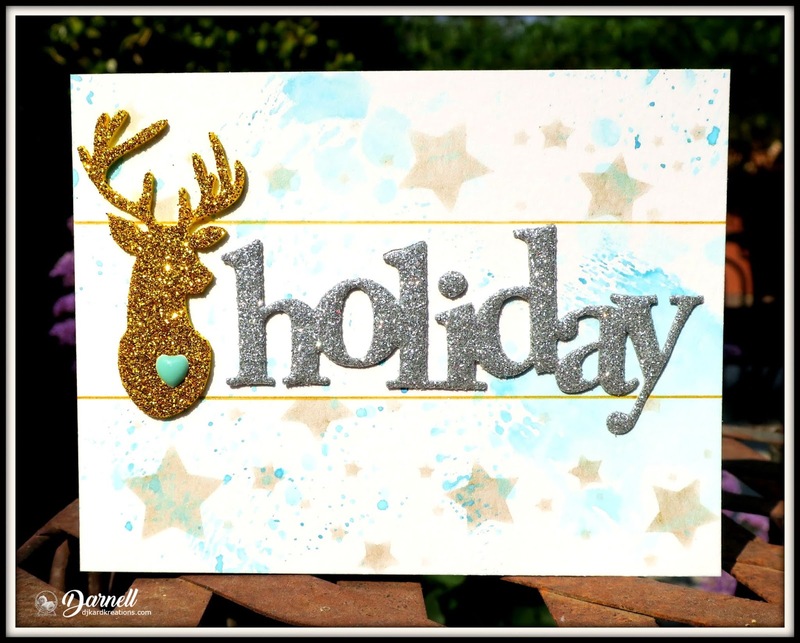 For this card, I used a star stencil and a dauber to daub stars in gold Brilliance ink. Then I spanked splashed the panel in Oxie aqua ink and when dry, I drew panel lines with a gold pen. The gold reindeer is from my stash and I die cut the holiday sediment in silver glitter foam. 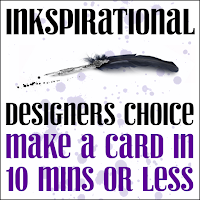 I'm entering this card in the current Jingle Belles challenge where the brief is to use the blog banner as inspiration. I'm also playing in the July Rudolph Days Challenge. I've been having a serious flare of my Crohn's Disease for the last several weeks which is now necessitating bowel resection surgery. Surgery will be on August 2nd, so I'm taking a short break. 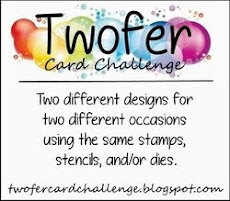 I'll be back on August 10th with my Twofer Card Challenge inspiration. While I'm gone, please be naughty, have fun, and remember . . .
Hi Darnell, As always fab cards. So sorry to hear this Darnell, wishing you all the best with your surgery & take good care. You have treated us to some extra's today, it's not as easy as it looks blending. Beautiful makes, clean, simple with a little added sparkle makes the best combination for the perfect life. Fabulous cards Darnell - the first one is my favourite - a fabulous design. Hope all goes well with your surgery. Glad to hear that you are safe from the terrific fires! I have see n them at the TV and I was very impressed... Such a disaster! Sorry instead for the necessity of your surgery, Darnell! I wish you all the best and a speedy recovery! 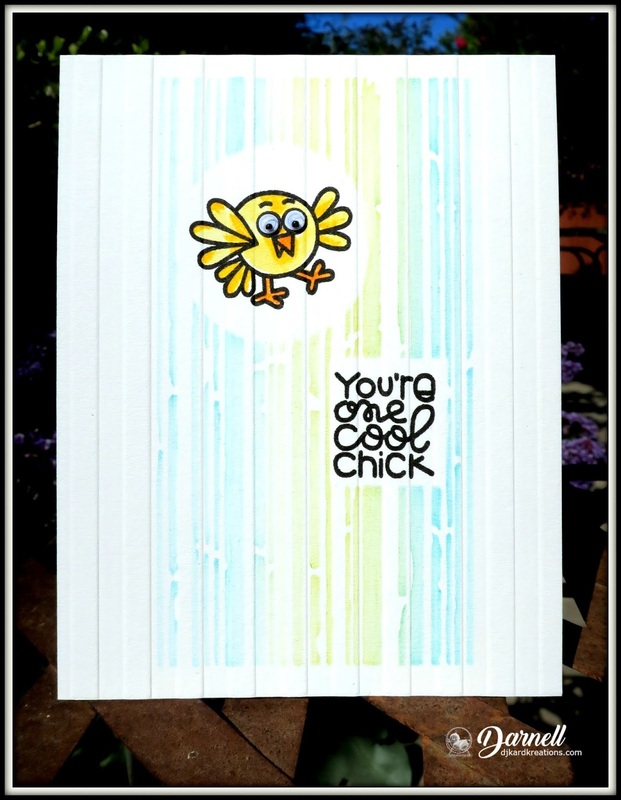 Your cards are all striking, and such great work with the striped stencils!! Big hugs and take care! Oh what a wonderful treat you (and Hammy, of course!) have given us today - not two, but four amazing creations! 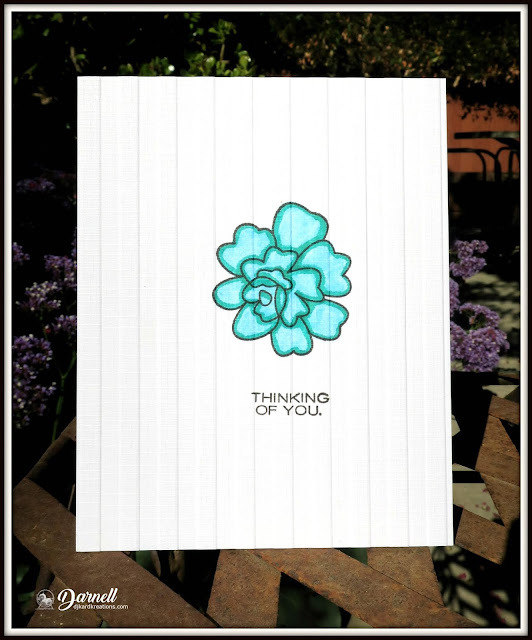 I so wish I could do cards the way you do my friend, you are such a wonderful inspiration! I could not even begin to pick a favourite, anyone would be delighted to receive any one of these beauties. I hope your preparations are going well for your op and that all goes well on the day. Fingers well and truly crossed in the hope that you get some relief afterwards. Sorry to hear you've had a bad flare up, hope the surgery goes well. I did wonder if you were around the area of the fires, horrific for those involved. My Son in law's Aunt's house backs up to the moorland fires that we had over here earlier in the month, v scary. What a fabulous collection of cards Darnell - you have been so productive my friend. I haven't used my stencils for a while and you made me itch to pull them out. The little chick cracks me up and the first card is so classy! I'm so glad your area is safe from the fires and I'm sending positive thoughts and good wishes for the surgery tomorrow. A brilliant selection of cards - lots of inspiration. Sorry to hear you are having problems. Wishing you all the best and come back soon to make us all smile. Sending prayers for a speedy recovery from your surgery! Oh I have to say, I adore all these cards. Wonderful Nautical design for Time Out. I love how you used the colours and gently blended these in...have no idea how you do this with brushos...any videos you know I can see how to do this, as I really can not use distress inks either...use,ems at it! And the moon gives the whole cards such a relaxing feel. So pleased you joined Time Out with this delight. And excited you took up my 10 min challenge and wow to doing this wonderful card in 4mins. I love you stamped this first then used this embossing folder after, what a fab look this gives. A joy to see you at Ink too! Beautiful cards. LOVE that first one in particular. Wow! Take care and sending big hugs. All will be good. Look at you go Darnell, playing along with seven challenges in one day! What a great gallery of cards. Especially love your one layer striped beauty, such great masking and stenciling. So happy you shared with us at STB. Sorry to hear you've not been well, and sending well wishes your way! Hugs!!! Sending wishes for a speedy recovery. Will be thinking of you. Such pretty cards! loving the stripes! Wow, four cards! I love the first one especially. I saw that 10 minute challenge and passed it by, the last time I did that I hurt myself with scissors. First, I'm thankful the fires are not near you! What devastation they are causing and how horrible for the people who have lost loved ones and homes. Secondly through fifthly, a fun selection of cards! 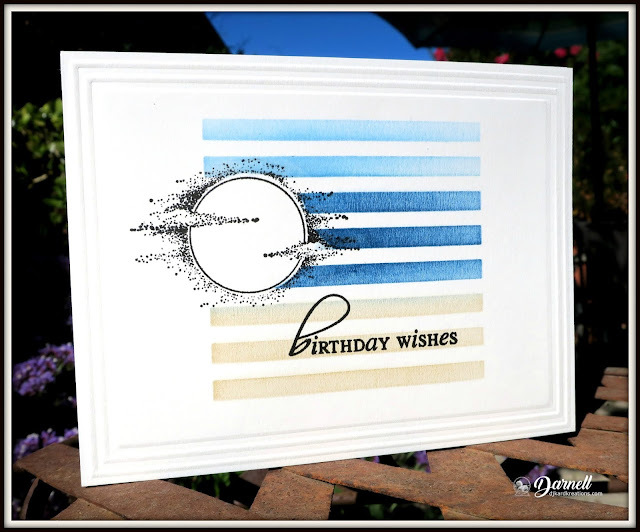 Love the stripes and your four minute card especially! The embossed linen was a brilliant idea! Love all that texture with the beautiful bloom! I'm praying for you before, during and after surgery. May God bless you with a successful surgery and quick recovery! Mwah! A fabulous selection of cards Darnell, it's amazing that one image can have so many different designs. Love the Christmas one especially. Fourfer, I'm in awe. They are such terrific cards too. I love that first card so much and a lovely job with the brushes. I can't use those TH tools either. The other cards are so cute and the Christmas card is stunning. I'm so glad you are safe from the fires but they are so brutal. So much destruction and those people displaced breaks my heart. My prayers are with you and the team for your surgery. May you have a quick and uneventful recovery and back 100% soon after. Love and hugs. You and Hammy have been busy. It always takes a while to get caught up after a vacation. I'm glad you are safe from the fires. I just cannot imagine the devastation from them. Praying your surgery goes well and you have a quick recovery. First of all I am glad you are okay and not in danger from the wildfires. And, secondly you certainly have been busy with the great array of wonderful cards you have created. I love all of them and I am so happy you have shared them. At least maybe I can absorb some of the fun you had making them since I am on a garden preparation break. I am working on a card but it is getting done in bits and pieces. But at least the freezer will be filled with goodies when our snow flies later on. So thanks so much for sharing. Amazing cards! Best wishes for a speedy recovery and relief from your symptoms. FABULOUS makes but your first one is STUNNING matey. Geez, give a girl a heads up, why don't you. I hope this all goes all right because I'm seriously concerned about your health. I'll be sending all the good thoughts I can muster to you. As for your cards, you know they are CAS or QACAS perfection...looks like you and Hammy really went on a tear. Honestly, cannot pick a favorite, they're all so cool. I know exactly what you mean by the lack of ready Christmas cards...my stack is pitiful. Be well, my friend. I'll be thinking about you. Hugs! Darnell good to hear you are not roasting on the spit of those fires. The fires bother me more than the threat of the big one rumbling through. YOur cards are all lovely in spite of the time it took to design and put them together. My Christmas card stack is way behind. My good intentions stopped in March. Oh well back to it soon. I'll be keeping good thoughts and sending prayers for a successful surgery and an easy recovery my friend. Hugs. Quite a line up today, Darnell! I'm super impressed with your nautical card. It's so clean and beautifully executed. Great for guys or for any beach/sun worshippers. Soft, pretty stripes and all the cuteness I love on your twofer, and I love that you can send joy in barely more than four minutes, as illustrated in your threefer. Make 'em, send 'em, spread happiness. I, too, am ridiculously behind in my holiday card efforts, but better than none at all. That stag head is so beautiful, especially all glittery gold. A very pretty card. Good to hear you aren't threatened by the fires. It's a sad state every year, worse and worse, it seems. Oops, I just read the very last paragraph. Sorry to hear you need surgery. I'll be thinking of you and hoping you're back in the pink soon. Can't keep a good woman down for long! ALL four of your cards are creative and nicely done (as always) A card in less than ten minutes!!!!! (and you did one in less than 4 minutes!) I think I have only done one card in less than 10 minutes. (I would be embarrassed to admit to people how long they take me some times! The cards are all fabby, and I especially love that cute little chickie :) Best wishes with your upcoming surgery - I expect you will be up 'n at 'em in a relatively short time, but I'm sending some healing hugs along anyway :) Take care of #1!!! Four fabulous creations Darnell and all brilliant designs. I have to say that the second one is my favourite just because of the really cute chick. Hope all goes well with your surgery and you are back on the 10th fighting fit and funny. WOW! What an absolute treat. I'm loving stripes at the moment so these designs are perfect for me ..... I love them all. Hi, Darnell! Thanks for letting us know your home is safe from the wildfires. It's always so scary, and even when we are safe, we can still smell the smoke from far away - so I know what you mean. Hoping these fires are soon under control. I love your two fer samples, and the only lined creations as well! Such beautiful soft colors, too. Thanks for uploading your fabulous creation to Back to Basics and Beyond Challenges. I hope we will see more of your artwork in our future challenges. Be sure to check back later to see if you have won! I am not surprised that you made 4 cards. Maybe it will ward off a bit of withdrawals that you may experience while recuperating! I am keeping you, the Mister and the whole surgical staff in my prayers. May all go well and may you heal quickly so we can see you back in the Playhouse!! Lin is coming down end of August, maybe we can skype again!! Swooning over this brilliant collection of cards, Darnell. Love the colours and layout of the first card for our stripes challenge. The embossed frame is a great touch on OLCs. Thank you for joining us at Less is More. So glad to see you are not affected by the fires. Sending you love and hugs for your upcoming surgery. Wishing you a speedy recovery. Love your jingle belles banner inspired design ... especially the teal heart ... so glad you joined us. Darnell, sorry to hear you have to go in for surgery. Here's hoping you feel much better after. you've been super busy with all your cards, you blending is so pretty, love both of your stripy background simply perfect, and I'm with you with the xmas cards, need to get busy. Well, you hand me at Clarity Stencil Brushes! My goodness that’s some beautiful blending of the blues in the first card! All of your cards are beautiful! So glad to hear y’all are safe from the fires. Not good to hear about your surgery. Nine months removed from mine and I don’t like hearing someone as sweet as you having to go through this. Sending many prayers and lots of hugs. Hang in there sweet friend! Darnell, sending you love, hugs, and positive thoughts for the surgery, and hoping it makes you feel much better afterwards. Love all of today's cards, especially the first one - those stripes are fabulous and I love the stamp you used - sounds like one of those oldies but goodies. Your cards are awesome, as usual. I especially love that little chick card. 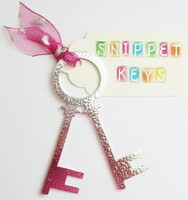 It's simple design lets that little chick shine in the spotlight! I do hope your surgery goes well and that you surprise your doctor with your ultra-quick recovery. Just loove your first card; have the same stamp and not using it much; so thanks for this great idea! Gorgeous cards! You've been busy! :) Thanks for showing us your project this week at UYS and I hope we'll see you for our next challenge! Gracious, afourfer. All creative and all excellent. You are still on my prayer list. Naughty????? Never!!!!! Smile. All of these cards are so great! Love your clean and bright designs. The stripes on the birthday card are fantastic! 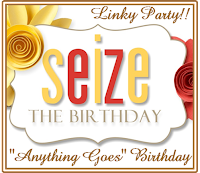 Thanks for playing along with Seize the Birthday. p.s. I'm always amazing when people can make Christmas cards in the summer. p.p.s. hope surgery goes well! A fantastic collection of cards Darnell, especially the Christmas one. But we do know that it goes away and apparently is a wee bit harder as we age. I seem to remember only 2 or 3 days of it on our previous trips. But this time we were away longer and we are 4 or 5 years older. ahem! Your card is so lovely. I like the techniques you used and may give this idea a try. The two drawn lines are so perfect with this design. I would not have thought to sprinkle the oxides after the stars...as I am such a beginner at inky works. That surgery sounds like a lot to go through. Will keep you in my thoughts. Concentrate on you for the next little while...I know that is hard to do, but you are the important one now. Thanks goodness you have such lovely and strong family to help you heal and encourage you. When you are better, I would love to hear about the Vancouver retreat! I am close by and have an empty ground level suite if you ever come again or want to visit with your husband! 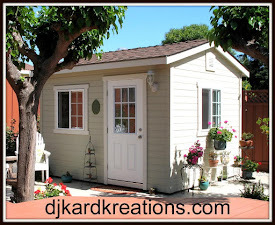 I keep it open now for family and friends to have a free place to stay while they are in town! Oh bummer! So sorry to hear you had surgery today & I'm sending big hugs, love & wishes for a successful surgery & speedy recovery. Fun seeing your cards--loving the Christmas one, of course! I'm sorry to read you have needed surgery and hope you are now on the road to recovery. These health issues can be such a pain! Each and every card is totally awesome, Darnell. You are so well versed in the CAS card thing. Wow, they just boggle my mind. As I am reading this, I see that surgery was yesterday. Here is hoping it was a great success. Crohn's is a "B". Well you have been busy! Terrific cards and I especially like that first one! I'm so sorry to hear that you have to have more surgery... I do hope that you are feeling better very soon. Thinking of you and sending gentle hugs your way. such amazing cards all round, but of course i'm bound to say the amazing reindeer one at the end is my favorite and truly it is BEYOND beautiful! thanks for joining our banner-inspired fun at JINGLE BELLES! so creative and original, I love your cards and stripes! wishing you a very speedy recovery! wow these are gorgeous... awesome designing.. These are so nice cards! I'm so pleased to read you are safe and sound. What a fantastic selection of cards all just wonderful. But the one that had me was the first one - fab composition. What an amazing post with so much card- eye candy! I absolutely love your first card, your stamping and use of stripes is very unique... And you already know how I much I adore that embossing folder! It adds so much interest to a CAS design and gives the card such an elegant feel. Thanks for joining us at Less Is More and Time Out! Wow, I missed this post about your upcoming surgery, which has already happened apparently. I'll be thinking of you as you recuperate and hope that you don't run into any complications. It's bad enough to have the surgery without snags, right? Love your quartet of fabulous cards! What a burst of creativity! Especially adore your take of the photo inspiration at Time Out! Hope you'll be home and completely recovered soon! I'm glad to hear you are safe from the fires. I hope the recent surgury was a success and sees you feeling better. Not a fun condition or surgery, I do hope you will at least feel better afterwards. Your nautical CAS caught my eye with its simplicity, I must try brushes with my inks as, like you, I'm not overly confortable with the TH foam bits for Distress inks. A lovely set of cards, Darnell! Hope your now recovering from going under the nice and being sectioned. (I've been trying to get the Doc Sectioned for years with no luck). Gorgeous arraiinment of cards. The top being my fab. Hugs Mrs A. These are all fabulous designs, so different, the only thing they’ve got in common are stripes of some sorts. The first one is CAS perfection, perfect for a man or even a woman, and it has a style that will never go out of fashion. Congrats on being winner at Time Out, you won a prize and we would love you to be GD, see blog for details. Hope recovery is going well. I did leave a comment early but can’t see it now...strange!! Hoping your win at Time Out's challenge is making you feel better and that everything is well with you now. When you're on a roll you really put out the cards, Darnell. Four for the price of one visit. The stripes look good along side that moon and the Clarity brushes got darker color than I usually do. I find the secret in DI blending is not the dauber but the paper. Bristol is the answer. Your 4 minute card is CAS perfection and the holiday card looks just like the banner that was your inspiration. I'm so far behind in commenting that I didn't know about your surgery but since I've seen you back up and running I'm assuming all went well.